This was used on Kardinal's @KardinalO song "Mi Nina" produced by SupaDups @SupaDups . The Metric Halo Channelstrip plugin ($345) was one of my first plugin purchases. I've used it on many projects over the years. 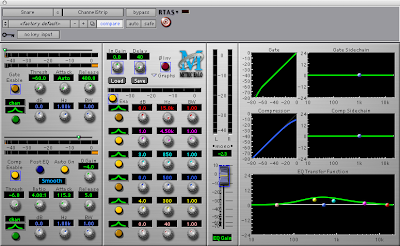 The Channelstrip consists of a dynamics section (gate/compressor) and a six band eq section. Each eq band can be parametric high cut, low cut, low shelf, high shelf or band-pass filter type with each band capable of 20hz to 20khz frequency selection. This allows you to do drastic surgical eq or broad enhancement of sounds. There are two additional eq bands that are used as sidechains for the gate and compressor section. A nice feature of the compressor is the auto gain button which automatically adjusts the volume for the amount of compression that's dialed in with the threshold and ratio knobs (the SSL console dynamics section works in a similiar fashion). The plugin doesn't have a "color" to it as some others do but I see this neutral sound as a plus and makes it an excellent choice for sonic surgery. It works well on a large variety of sounds including drums, guitar, strings, brass, vocals and synths. The meters and graphs on the right side of the interface come in handy when making adjustments and you can actually grab the points on the graph and adjust the eq if you prefer. PSP oldtimerME compressor plugin - $79 until May 31st. I've been a fan of PSP (Professional Sound Projects) for years and their oldtimerME compressor plugin will definitely be added to my plugin list. PSP oldTimerME a vintage-style compressor designed for demanding track and program compression, limiting and mastering processing. 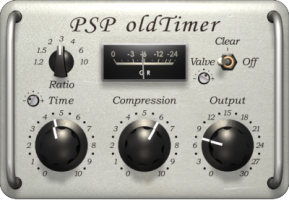 PSP oldTimer a vintage-style compressor designed for track or program compression and limiting. Our goal in developing these plug-ins has been to provide you with versatile compressors that offer detailed control and an exceptionally musical sound. PSP oldTimer plug-ins are not based on any specific hardware, rather they are inspired by vintage circuits and we designed them to emulate our favorite characteristics of such compressors. The PSP oldTimerME version of this compressor combines advanced features such as the option to process left, right, mid or side channel exclusively while being very simple to set up - which makes it hard to go wrong! In case of PSP oldTimer our goal was to provide a simple compressor that offers an exceptionally musical sound while requiring a minimum of tweaking. PSP oldTimer is so simple and so easy to use, that it's difficult to make it sound bad even at extreme settings! These compressors offer soft and smooth compression in most applications, however they may slightly color the sound with their tube emulation on transients when heavily driven internally by high compression values." Here's a pic of a setting i came up with in less than a minute for a song I'm currently mixing. This was placed on the drum buss. I was able to dial in the sound I was looking for very quickly. I especially like the HPF filter and the fact that there are Hi, Mid and Low settings for the Valve emulation. For transparent compression set the Valve switch to clear. As with some of PSP's other plugins the oldtimerME allows you to do parallel compression very easily. You can also turn off the wet and dry mix by clicking on the words DRY and WET above the knobs (notice the line through Dry in the pic). Go to PSP oldtimer download the demo and try it it for yourself. The Pleasurize Music Foundation began operations in January 2009 and is a nonprofit organization based in California, USA. Their aim is to re-establish dynamics as an essential part and important means of expression of all genres of music. "DR (or Dynamic Range) is a term for the degree of dynamic variation within a piece of music or album. Low values (e.g. DR3) reflect a high abuse of compression. Tracks that are DR3 have a range of three decibels between the average and peak program signal. A natural recording, with a low amount of dynamic processing, would have a much higher DR value (e.g. DR12+). The DR system is intended to avoid black and white judgment of dynamic quality. While DR7 is low for rock music or very low for Jazz, it is quite acceptable for electronic club music which has nowadays often values below DR4. All values above DR12 have generally a high dynamic quality." Thanks to my good friend and fellow engineer/producer Frank @Alphabeatmusic for bringing this to my attention. Waves is currently having a sale on many of their plugins including the C4 which is one of my favorite plugins for processing vocals. A multiband dynamics processing powerhouse, the C4 does it all: Four bands of up and down expansion, limiting, and compression, plus dynamic and standard EQ. Combining technologies from our acclaimed Renaissance Compressor and the powerful C1 Parametric Compander, the C4 gives you unprecedented control over the contours of your tracks, with maximum clarity and transparency. Download over 70 free custom C4 presets for vocals, drums, bass, guitars, problem-solving, mastering and more, direct from some of the hardest working engineers in the business. I used this for Joss Stone's hook on "Young At Heart" produced by Salaam Remi for her album "Mind Body & Soul". The Waves C4 Multiband Parametric Processor is a versatile plugin that's included in the Platinum, Diamond and Mercury bundles. It's transparency and flexibility has earned it a prominent place in many engineer's toolbox. To quote the manual "You can think of the C4 as a dynamic equalizer capable of gentle compression, expansion, limiting and EQ, independently and simultaneously." The C4 can be used on the stereo buss, group auxes or even individual tracks. It works exceptionally well for vocals where I usually place it on the aux master for the backgrounds. The C4 is complex but it's interface makes it fairly easy to use. The controls (see pic) consist of Threshold, Gain, Range, Attack and Release for the four individual bands and a master controls that affect all bands at once (right side of interface). 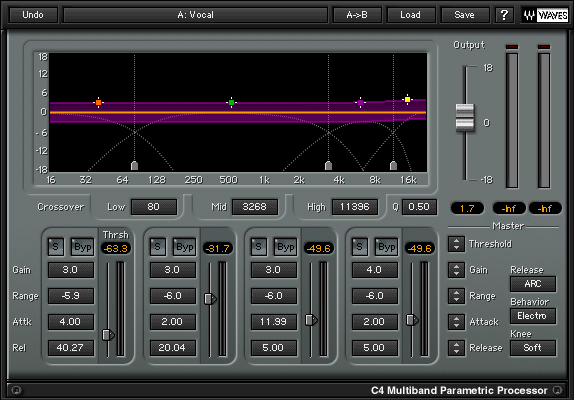 I especially like the solo and bypass for each band that allows you to zero in on any problem frequencies with ease. The Threshold works in conjunction with the Range control in that the amount of gain reduction is half the range value (-6.0 Range means -3dB reduction). The gain control allows one to adjust the output level of each band independently. The Range control serves a dual purpose. When the values are negative(-) it's a compressor when the values are positive(+) it's an expander. The attack and release behave the same as a standard compressor. The master controls will change all the values at the same time so the interaction between the bands will not change. On the far right of the interface we have the Release, Behavior and Knee controls. The Release allows one to choose between Waves ARC (Automatic Release Control) and manual. The ARC works best in most situations. 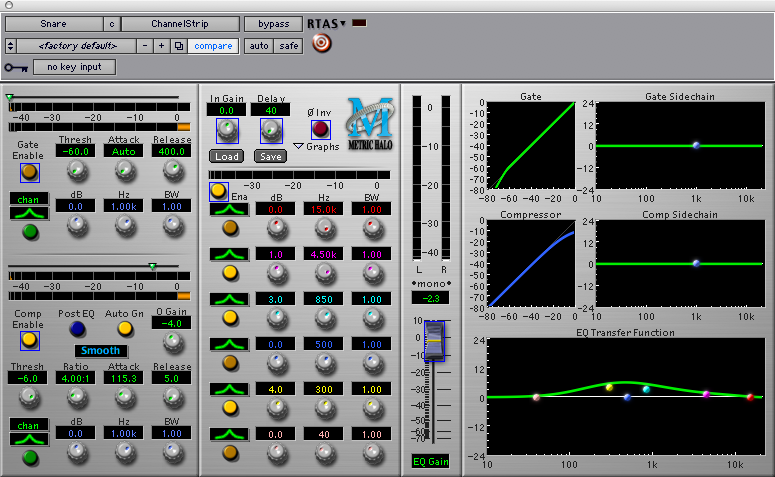 The Behavior control lets you choose between Electro and Opto compression (similiar to the Rennaisance Compressor). Electro has slower release times at higher compression settings and Opto (think LA-2A) has faster release times at high compression. The Knee control can be set to soft or hard or values in between if needed. The crossover points can be changed by dragging the small grey handles at the bottom of the display or clicking directly on the Low, Mid, and High value boxes and entering the numbers with the keyboard or mouse. The Q (bandwidth) setting is global. (Waves tip: For “tighter” sound, adjust the Q to a higher setting.) Finally the output fader sets the final output of the C4.